It's time for our bodies to detox and shed all the heaviness from winter. Lisa is our ASC recipe queen, she's always sharing her new favorites with the team and we love her for it because we've all found some of our favorite dishes to make through Lisa's shares. She's going off for maternity leave in the next couple of weeks (congratulations!) so we figured we would share one of her favorites with all of you this month too. When I asked her for a share for you guys, she actually sent three, typical, but I got the details and this one is her absolute favorite. Be sure to choose a large bunch of kale (or two small ones) or the salad will be overly salty and over-dressed. By large, I mean 16-20 leaves that are at least 12″ long. De-stem kale by pulling leaf away from the stem. Wash leaves. Spin or pat dry. Stack leaves, rollup and cut into thin ribbons (chiffonade). Put kale in a large mixing bowl. 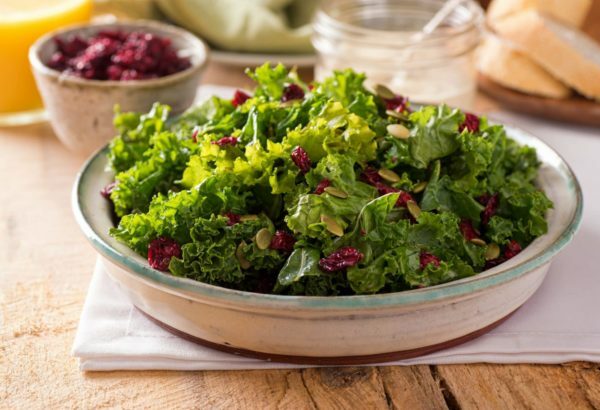 Add salt, massage salt into kale with your hands for 2 whole minutes. The volume of the kale should reduce by about 1/3. To toast seeds, put in a dry skillet over low to medium heat and stir constantly for a few minutes until they change color and give off a nutty aroma. Dress with oil and vinegar and toss. Taste for salt and vinegar, adding more if necessary. When at desired flavor, toss in cheese. Happy Springtime salad making everyone! Let us know how you like it in the comments below. I have been told by my nutritionist that it is not healthy to eat fresh kale (not just for me, for everyone.) That it should be cooked. The salad will be great with any greens! This sounds like my kind of recipe!!! And congrats to Lisa on the birth of her beautiful baby girl!